When I first read that what is now being called the Grand Lucayan Bahamas had all four Grand Slam surfaces, I was skeptical. 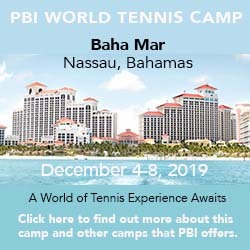 This is not, after all, a vast tennis complex like Florida's Saddlebrook, where touring pros come to train and need access to the same surfaces they'll face in tournament competition. The Grand Lucayan only has four courts altogether, and a clientele that consists mainly of beach lovers and convention groups, so it seemed unconscionable to me that the resort would put in a single instance each of grass, French red clay, Decoturf, and the former Australian Open surface Rebound Ace. And yet, that is precisely what they have done, laying them out in a staggered line immediately behind the 540-room Radisson, one of two hotels—the other a 478-room Reef Village—at this 372-acre Grand Bahama Island beach resort. As a guest of either the Radisson you have access to the courts and some limited programs, including private lessons and a couple of junior programs each week. Lessons are available from head pro Grovenor Williams, Jr., a USPTR-certified pro who was born on Grand Bahama Island and taught at several other Grand Bahamas properties before taking over at the Grand Lucayan. Apart from private lessons, there are a couple of junior clinics each week. Court fees are steep: $25/hour on Decoturf, $35/hour on Rebound Ace, $50/hour on red clay, and $100/hour on grass. The focal point of the resort is naturally its beach, a ribbon of soft white sand, occasionally interrupted by piles of boulders, bordered by turquoise waters and coral reef. Both hotels sit far enough back from the beach to allow space for swimming pools and several oceanfront bars and restaurants, China Beach, Willy Broadleaf, and China Grill among them. Otherwise, the resort holds an extensive array of other diversions, including two 18-hole golf courses and a golf school, a well-equipped fitness center, a spa, and a casino. Across from the hotels is a marina and the Port Lucaya Marketplace, a collection of Bahamian-inspired cottages in pastel blue, lemon yellow, pink, white, and turquoise that comprise a village of shops and restaurants around a plaza where there is evening live entertainment. The Radisson is the newer of the two hotels, and its rooms have generous balconies with beach or island/marina views. Reef Village has a lower architectural profile is slated for refurbishing this summer. Both have several swimming pools, among them a rimless beachfront pool at the Radisson and a Sugar Mill Pool with tower water slide and waterfalls at Reef Village. General Tourist Information. Grand Bahama Island is 52 miles east of Florida. Several airlines provide service, among them Spirit Airlines, American Eagle, Bahamasair, Continental Airlines, Gulf Stream/Continental Connection, JMC Holidays, US Airways and, most recently, Vision Airlines. As a U.S. citizen, you'll need a passport or a birth certificate backed up by photo ID like a valid driver's license. The hotels are roughly 20 minutes by cab from the airport. For more information about Grand Bahama Island, visit the official tourism site www.gograndbahamavacations.com or phone toll-free 800-545-1300. So far, I haven't received any written feedback on Grand Lucayan Bahamas (closed) and Radisson Grand Lucayan. If you've taken a tennis vacation there, I'd like to hear your reactions.